Party-list proportional representation systems are a family of voting systems emphasizing proportional representation (PR) in elections in which multiple candidates are elected (e.g., elections to parliament) through allocations to an electoral list. They can also be used as part of mixed additional member systems. In these systems, parties make lists of candidates to be elected, and seats get distributed to each party in proportion to the number of votes the party receives. Voters may vote directly for the party, as in Albania, Argentina, Turkey, and Israel; or for candidates whose vote total will pool to the party, as in Finland, Brazil and the Netherlands; or for a list of candidates, as in Hong Kong. Voters in Luxembourg's multi-seat constituencies can choose between voting for a complete list of candidates of a single party ("list vote") or voting for individual candidates from one or several lists ("panachage"). The largest remainder (LR) methods, including the Hamilton method. List proportional representation may also be combined in various hybrids, e.g., using the additional member system. While the allocation formula is important, equally important is the district magnitude (number of seats in a constituency). The higher the district magnitude, the more proportional an electoral system becomes - the most proportional being when there is no division into constituencies at all and the entire country is treated as a single constituency. 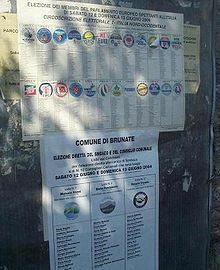 More, in some countries the electoral system works on two levels: at-large for parties, and in constituencies for candidates, with local party-lists seen as fractions of general, national lists. In this case, magnitude of local constituencies is irrelevant, seat apportionment being calculated at national level. ^ "Proportional Representation Systems". mtholyoke.edu. ^ "Proportional Representation Open List Electoral Systems in Europe" (PDF). International Foundation for Electoral Systems. Archived from the original (PDF) on 2014-12-24. ^ "Système électoral du Grand-Duché de Luxembourg(fr)". elections.public.lu. ^ Benoit, Kenneth. "Which Electoral Formula Is the MostProportional? A New Lookwith New Evidence" (PDF). Archived from the original (PDF) on 2010-06-24. ^ Wilson, Helen J. "The D'Hondt Method Explained" (PDF).